. 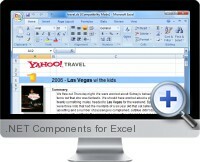 NET Components for Excel is a suite of native .NET components allowing to read, create and modify native Excel (xls) files, without needing to have Excel installed. .NET Components for Excel Supports Excel 97 and higher. Generates Excel files from Win Forms, Web Forms, ASP.NET, Pocket PC applications, web services on the fly and fast. Native .NET components (no additional OLE or DLLs required) allowing to read, create and modify native Excel .XLS and .XLSX files without needing Excel installed. Supports Excel 97-2003 .XLS file format and Excel 2007/2010 .XLSX format. Fast and solid hand tuned Excel file engine capable of generating thousands files per minute. Able to modify Excel files and keep almost everything existing on the original file, from macros to ActiveX objects. Recalculation of more than 200 Excel functions. Ability to read and write encrypted Excel files. Runs on .NET 1.1 to .NET 4.0, Mono and the .NET Compact Framework (XLSX support requires .NET 3.5 or higher). Templates can be stored inside an executable file, in a database or in any place from where it cab be accessed it as a stream. Extensive API is available to programmatically write and read files, with formatting info, images comments, etc. Export to HTML in HTML 4.01 strict or XTHML 1.1 with full standards compliant. Report Engine that creates complex reports using Excel as the report designer, so final users can modify them.